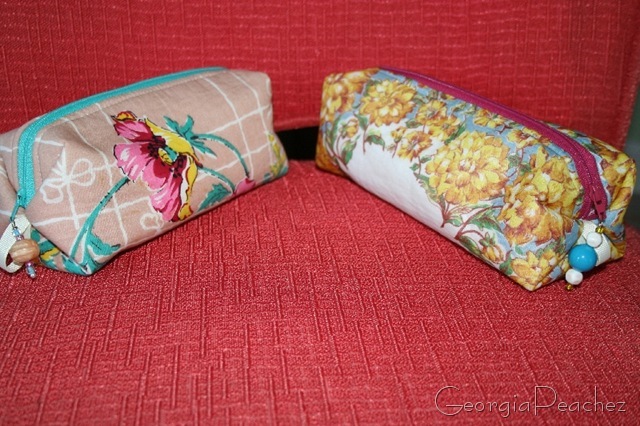 I've been working on more little cosmetic bags made from vintage hankies. 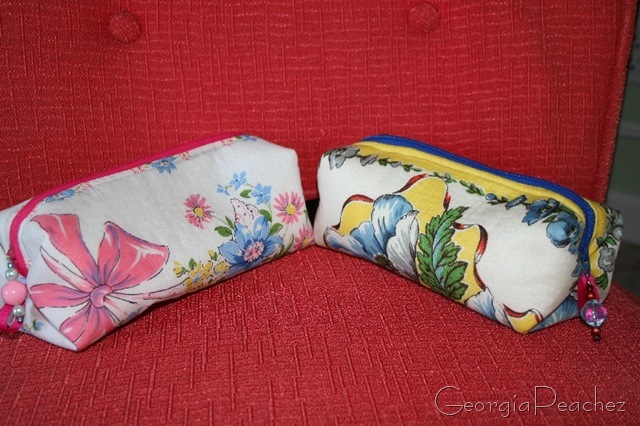 They are lined with a pretty floral oilcloth and I have made unique beaded pulls for the zippers. I'll pop them in my etsy shop soon. Ciao! I want the one with the pink bow please. Too cute. This is a great idea and use for old hankies. wow…. they just don’t make hankies like that anymore…. or do they and I have never found where they actually sell them? All of your bags are beautiful…. Awesome bags, Suzy! How long and wide are they. I am trying to remember how big a hankie is. They are darling! I never could get the zipper part of sewing down. And you do lining? You must be super talented! Those are adorable! What a fabulous idea (for you that is, I cant sew a straight line). Hi Suzy – just read your comment about being in town tomorrow and stopping by SuzAnna’s Antiques. You will love those gals – Susie, Anna and Linda – make sure you tell them you found the shop via my blog. I’m going to e-mail you now – prhaps we can get together! yet another awesome use for the little hankies my husband snickers at me for collectiing. 😀 Really, he asks me, what if someone ACTUALLY blew there nose in that?? Silly man. I LOVE MY NEW BAG!!!!!!!! Every time I take a trip I’ll think of you when I see my new bag. Thanks!!!! Love it!